Vectis Marine Design has proven in-house capability in the design of boat and other marine structures in advanced composites, GRP and aluminium alloy. Structures can be designed to a variety of rules and standards including Classification Society, ISO, SOLAS and Finnish Commercial Craft rules. Recent vessels with advanced composite structures include two high performance, weight critical and multi-role military boats which have been designed to the Bureau Veritas NR600 and NR546 rules and incorporate cored hull shells, plate girders and frames and deck panels all manufactured from infused vinylester resin and incorporating E-glass and carbon reinforcements. These complex craft have numerous strong points the foundations of which have been designed to be integrated with the hull structure to minimise weight and production costs. Vectis has previously designed the hull structure of a novel 22m high speed craft and a next-generation 8m RIB both of which have extensive use of cored and resin infused structures. Vectis has developed an extensive software suite to design and analyse such structures, and those in GRP and aluminium alloy, and makes regular use of FEA to analyse high load and weight critical structures. This capability is available as part of a complete boat design package or as a stand-alone service to support other naval architects and boat designers, and shipyards. 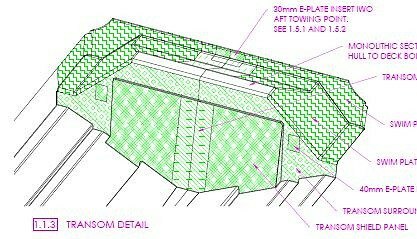 We welcome enquiries to carry out the structural design and analysis of vessels and other marine structures.